I took a Field Guides trip led by Doug McRae and Megan Edwards to Newfoundland and Nova Scotia in July 1999. 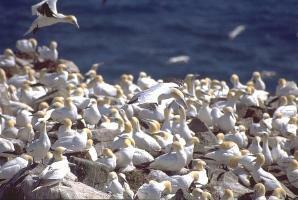 One of the highlights of the trip was the big seabird colony at Cape St. Mary's, Newfoundland. When we first arrived, we found ourselves surrounded by fog. The gannets were barely visible, and we had to be very careful to make sure we knew where the cliff edge was. 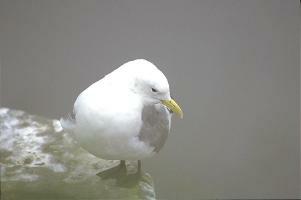 Although other seabirds use the cliffs, only Gannets and Black-legged Kittiwakes were visible. 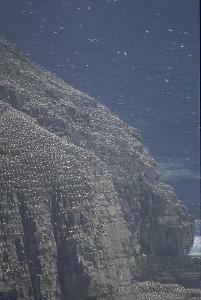 The Murres and Razorbills that nest near the base of the cliffs were invisible. Fortunately, we had already seen Razorbills and both Murres at Witless Bay, but it would have been nice to see them on the cliffs. 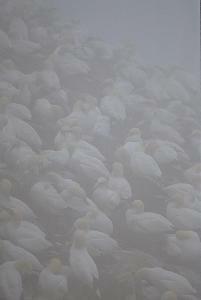 After watching the Gannets in the fog for a while, we walked back to the vans and started to leave. As we were starting to drive away, we noticed the fog seemed to be lifting, so we immediately headed back to the parking lot. From there we trekked to the cliffs, which were becoming more visible all of the time. 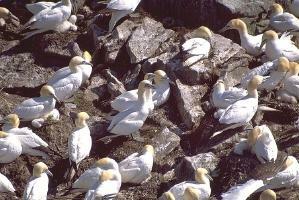 We got great looks at the Gannet colony. 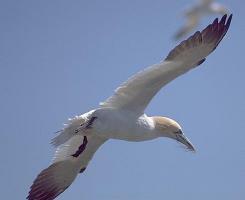 If you look closely at the photos you will see several baby Gannets underneath the adults. We also got to see the cliff base, and the Murres and Razorbills that were present there.